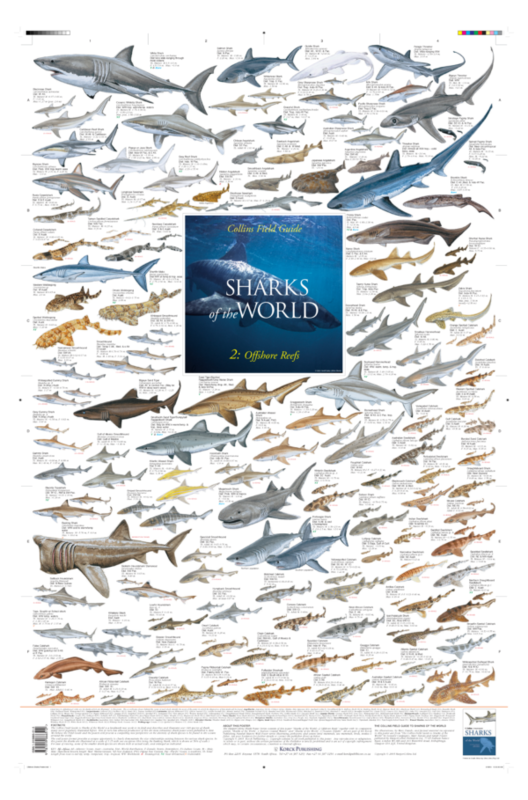 The Collins Field Guide to Sharks of the World, published in 2005, was a landmark new work in its field and described and illustrated over 440 species of shark, many never popularly illustrated before. This in turn allowed production of the Korck Publishing series of three wall poster subjects “Sharks of the World – 1: Inshore Coastal Waters”, “Sharks of the World – 2: Offshore Reefs” and “Sharks of the World – 3: Oceanic Depths” the most exhaustive shark poster series ever published. The Field Guide and the shark poster series have provided a compelling new perspective on the diversity of shark species to be found in the oceans around the world. The wall poster format provides a unique opportunity to clearly demonstrate the size relationships existing between the various shark species. The Korck Publishing “Sharks of the World – 2: Offshore Reefs” wall poster subject shows 117 shark species brilliantly illustrated by Marc Dando, and includes angelsharks, carpetsharks, catsharks, gummy sharks, hammerheads, houndsharks, nurse sharks, sharpnose sharks, smoothhounds, swellsharks, thresher sharks, sand tiger sharks, weasel sharks and wobbegongs. This poster will adorn any wall at home, in the waiting room, at the office or in school or university. It will make a perfect gift not just for people interested in sharks but for nature lovers in general. The wall posters measure 900 mm x 594 mm (35.4 x 23.4 inches). The posters are double laminated (ie laminated both sides) for ultimate protection, and will be shipped to you in a sturdy postal tube. Many of our customers throughout the world choose to frame or blockmount their posters such is the quality and impact of the posters themselves.